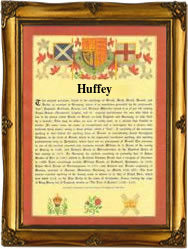 This name, with variant spellings Huff, Huffy, Houfe, Hughf etc., derives from the Old English pre 7th Century 'hoh' literally meaning 'hell', but used here in a transferred sense to describe a projecting ridge of land, and was originally given as a topographic name to someone who lived by such a natural feature. The surname was first recorded in the latter part of the 14th Century, (see below). One, Thomas Hoofe appears in 'the Register of the Freeman of York City', dated 1626, and on November 28th 1656 Katterne Houfe, an infant was christened in St. John the Baptist, Chester, Cheshire. James Huffey was christened in St. Olave's, Southwark, on November 14th 1661 and Mary Huffay married a John Whitefield on November 30th 1675 in St. Marylebone, Marylebone Road, London. Mary Huffey and Richard Hopper were married on January 20th 1686 in St. Annes Soho, Westminster, London. The first recorded spelling of the family name is shown to be that of William de Huff, which was dated 1379 in the Poll Tax Returns Records of Yorkshire, during the reign of King Richard 11, known as Richard of Bordeaux, 1377 - 1399. Surnames became necessary when governments introduced personal taxation. In England this was known as Poll Tax. Throughout the centuries, surnames in every country have continued to "develop" often leading to astonishing variants of the original spelling.